their new TV comedy series. A SHOP in High St, New Norfolk, will be the setting for a new ABC-TV series due to start filming this week. The show, Rosehaven, is an eight-part comedy written by Celia Pacquola and Luke McGregor. 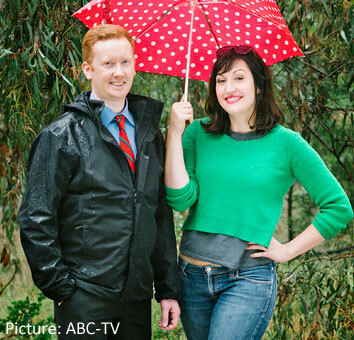 The producers are hopeful it will be the start of a long-running flagship comedy on the ABC. Tasmanian-born McGregor will play a man who returns home to run his parents' real estate business in the fictitious town of Rosehaven, which through the magic of television will be made up from locations in New Norfolk and Geeveston. The series will be filmed entirely on location in the state, creating jobs for 200 Tasmanians in the cast and crew. The production team will be based at the ABC Centre in Hobart and the first series will screen in the second half of this year. A member of the production team last week said the crew had fallen in love with New Norfolk and Circle St in particular. Local filming locations will include the visitor centre and historical centre, while Circle St itself will be used for "walking and talking" scenes. Luke McGregor will play Daniel McCallum, a Tasmanian living on the mainland, who returns to his home town to take over his family’s troubled real estate business. His best Melbourne friend Emma (Celia Pacquola). Tasmanian-based AFI Award nominee Kris McQuade will co-star as Daniel’s mother and Rosehaven Real Estate agent Barbara McCallum, and Katie Robertson will play Grace, the town doctor. McQuade and Robertson will soon be seen in Foxtel's The Kettering Incident, which also made extensive use of Derwent Valley locations. Geeveston will provide the main street for the fictional town of Rosehaven, whilst New Norfolk will provide other parts of the town centre and several other key locations for the series. It has been widely reported that McGregor's parents and their Moonah real estate firm provided the inspiration for Rosehaven. That business had a big presence in New Norfolk in the 1990s when it traded as Derwent First National Real Estate. It is now known as McGregor First National.